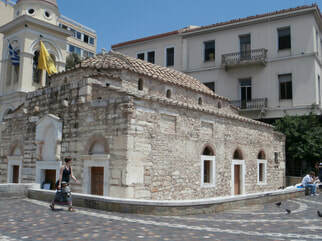 Monastiraki, (literally little monastery) is a distinctive old Athens area, with narrow, irregularly criss-crossing streets, and small buildings, typical of Ottoman and, to some extent, Byzantine urban planning. Here is the flea market neighborhood in the old quarters of the city of Athens and one of the principal shopping districts in Athens. ​On the outdoor stands of street vendors, or the small shops on the central roads (Adrianou, Pandrosou, Ifaistou, Thisseiou, Aghiou Filippou, Astegos and Ermou Streets) the area is home to several clothing boutiques, souvenir shops, and specialty stores, and is a major tourist attraction for bargain shopping. you can find anything, such as shoes and leather sandals, traditional clothes or hip garments, used or new furniture, old books and maps, antiques and curiosities. Early morning photo, Monastiraki Square, the shops closed. Close to the Monastiraki area, we recommend Electra Metropolis Hotel, on Metropoleos Street. ​The hotel boasts a small, rooftop pool, and a sun terrace with views of the city. Gourmet dishes and cocktails can be enjoyed at the top-floor restaurant or at the M Bar offering panoramic views over the Acropolis. The elegant rooms and suites feature a modern decor, wooden floors and warm tones. Each includes a marble-tiled bathroom with hairdryer, bathrobes, slippers and organic toiletries. A work desk, 40'' Smart-TV with satellite channels, a laptop safe and a mini bar are standard and Free WiFi access is provided throughout. A retro-style lounge area, where guests can enjoy coffee or a drink, is featured at the unique sky-light atrium. Guests can also taste Mediterranean flavors at the ground-floor bistro. 24-hour front desk and room service. The Traditional Ceramics section of the Museum of Folk Art on the left, housed in the mosque built in 1759 during the dark years of the Turkish occupation by Moustafa Agas (or Tzistarakis). Seeking lime for the construction of the Mosque, this savage removed and used the 17th surviving column of the Temple of Zeus! 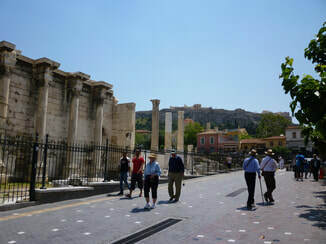 See the best of Athens in a morning walk full of surprises and contradictions! 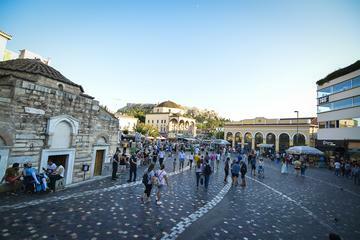 Enjoy a small-group half-day tour led by our expert local guide & stroll to discover some of the city’s most historic neighborhoods, including Syntagma, Plaka, Anafiotika, Monastiraki and Psyrri. Ideal for first-time visitors!